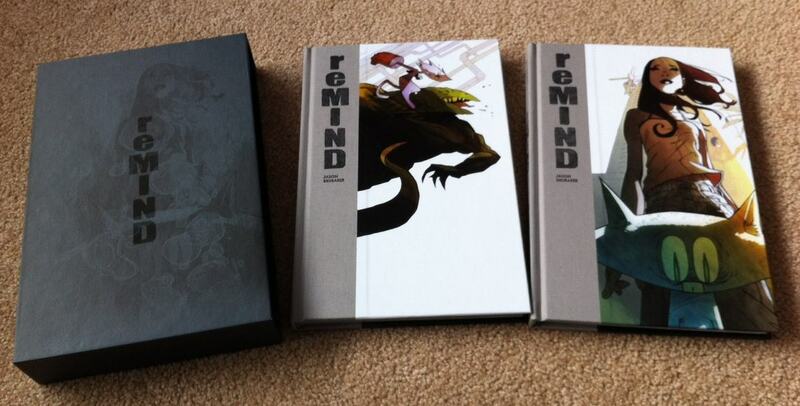 It’s taken me waaaay longer than I hoped to offer the reMIND Collectors boxset but with April 1st fast approaching as the release date for Volume 2, I decided it was now or never. So here it is! The only way to get this set is directly from me and I will only be offering 100 sets for sale online for the next 10 days. (until April 1st) Why 10 days you ask? Because I want to save some box sets for my convention appearances. So with that said, here is the link to my online store where you can pick up a box set if you missed my Kickstarter. If you would rather just get Volume 2 or both Volumes without a slipcase then head over to Amazon or your local bookstore to order a copy. Sorry, I can’t take custom orders at this time. Thanks again for joining my mailing list and I’ll let you know when the next cool thing is happening! This entry was posted in Columns and tagged alternative comics, indie comics, jason brubaker, kickstarter, online comics, remind. Bookmark the permalink. Follow any comments here with the RSS feed for this post. Post a comment or leave a trackback: Trackback URL.